Mountains or plains? Easiest or Hardest? Bike out and bus back. Mallorca Coast to Coast Cycle Route Choices. Leave in your own time and follow any of these brilliant one way routes to arrive at your collection point in either Sant Elm or Colonia de Sant Jordi after a brilliant day. Bike out and bus back, seats are limited. 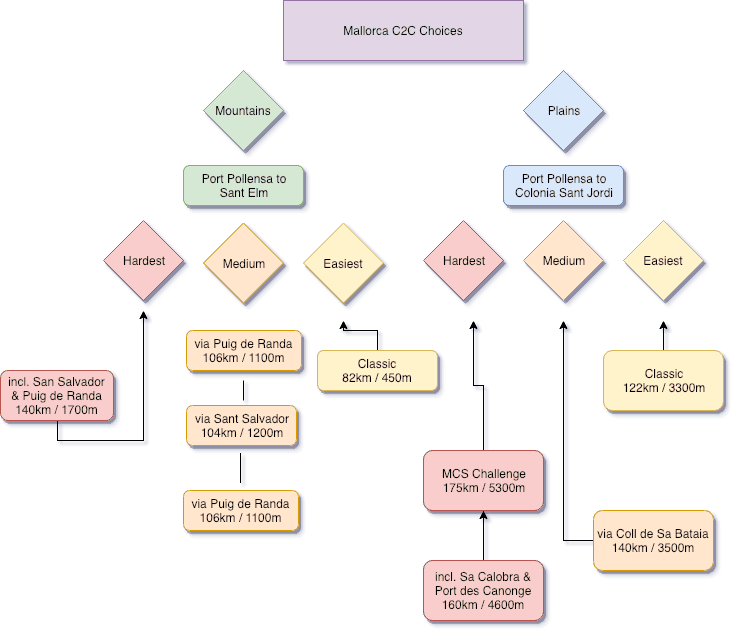 Mallorca Plains C2C – routes from the North that finish in Colonia de Sant Jordi. Mallorca Mountains C2C – routes from the North that finish in Sant Elm. Mallorca Cycle Shuttle - 1000+ scheduled bike buses each year to the start of the bucket list routes; Mallorca Bicycle Rescue in case bike or body break down; 365/24/7 private airport transfers and now the Sa Calobra Express for PB attempts with fresh legs.